I continue blogging about my recent trip to Cyprus: all posts can be found using this tag. This post is inspired by my considerations as to where to put Cyprus on my travel map. It’s beyond geographical Europe, but South Cyprus is in the EU, so I categorized it as Europe. 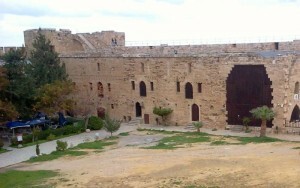 Still, traveling there made me think about the position of Cyprus in relation to its Middle Eastern neighbors. Historically, Cyprus was a strategically located island that crusaders used as a base on their way to Jerusalem. The restless, brutal knights built some of the fortifications remaining to this day. 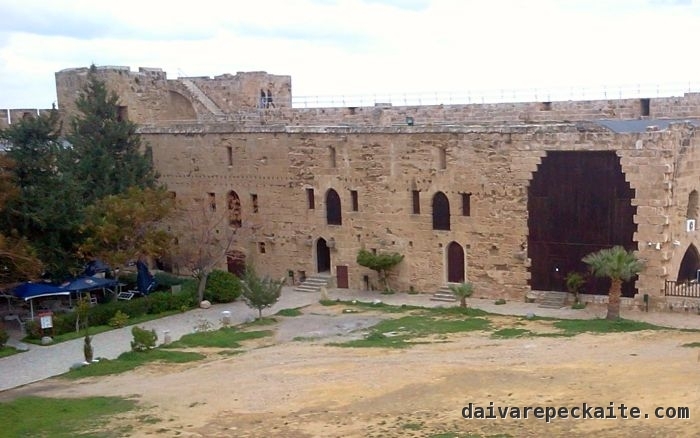 To tell its story, the castle of Girne/Kyrenia now uses dummies dressed in armor from various periods to spatially condense the different historical eras of the island: Byzantine, Lusignan, Venetian, Ottoman and British. In fact, the main touristic sights of many cities in Cyprus are various fortifications (in particular the castles of Larnaca, Famagusta, Girne and Limassol). In the past it did not matter who was European and who was Middle Eastern – other labels were important, but it is interesting to know that the island is never too far from what happens in either region. As a journalist focusing on the European Union I used to closely follow how the question of Cyprus impacts Turkey′s prospects of closing subsequent chapters in EU membership negotiations. As you can see on this official website, Turkey is in the process of active negotiation of anything that is about capital, governance, and a few things more, but nothing about people. The last negotiation chapter was on regional policy, the next ones will be on freedoms and justice. Turkey started negotiations together with Croatia, but the latter is already in. 2005 was the year when Turkey extended its customs union to the Republic of Cyprus, which joined the EU in 2004. Still, its ports and airports are closed to South Cypriot traffic, which is one of the main roadblocks for further negotiations with the EU. Although Cypriots from the South as well as from the self-declared Turkish Republic of North Cyprus, only recognized by Turkey, enjoy free travel across the island, authorities continue to fuel hostility between them. In the meantime, Cyprus remains an inter-regional hub for business, studies and travel. As you may have heard, the economic crisis in Greece spilled over to Cyprus, and it had to be bailed out. The trends made me write this unlikely comparison with our Baltic neighbor. In addition to being a tax haven for businesses, notably for Russia, Cyprus is a popular destination of British pensioners – the UK government even compiled a guide for them. Anyway, why am I writing about the EU and Russia if I promised a blog post about the Middle East? The trick is, while South Cyprus has become a tax haven for Britons and Russians, North Cyprus is attracting scores of Middle Eastern students to its abundant universities. The trend is so huge that, as the number of countries that North Cyprus students come from hit 110, the New York Times ran a feature on it. In fact, the feature article is so rosy that it almost sounds like a PR text. I heard more critical voices when traveling around North Cyprus, but all people I met there acknowledged that what they had there was anyway better than they would get at home. Some dreamed of using North Cyprus as a stepping stone to access education in Europe. During my trip, I talked to four Iranians (two graduates, one master′s student and one PhD candidate), a student whose family has lived in various places in the Middle East and South Asia, an Egyptian, and two Palestinians from Gaza. For all of them education in North Cyprus was affordable and accessible due to the dominance of the English language at all levels. As we sat at a university canteen, my friend and myself wearing our North European scarves and coats during the coldest weeks of the island′s winter, we saw a group of Africans at the next table, looking relaxed in their sandals and patterned shirts. In particular, I thought about the students from Gaza, for whom any place is probably better than where they come from. Even the Economist recently published an almost teary article to show its readers, who are more used to thinking about GDPs, that the situation there is awful. I had never met anyone from Gaza before, but I had heard about the fear, PTSD and joblessness there. In North Cyprus, I thought to myself that the frequent sight of militarized ′forbidden zones,′ several checkpoints, and caution that one must exercise in order not to offend anyone by using a politically sensitive term certainly don′t constitute a cultural shock for them. Some of these students will stay. They will join the multilingual academic staff of North Cyprus (we actually met one academic from Turkey, too). Some of them will start businesses as some of their co-nationals are already doing (thanks to our new friend, we met a charismatic Iranian beautician, whose daughter is growing up trilingual). Some of them will be sports stars, and we saw one example. Some of them are determined to never go back to their countries of origin. South Cyprus considers all these foreigners to be illegal immigrants, because their residence permits were issued by the TRNC authorities. So unlike Turkish Cypriots, these students cannot take a trip to the South. ′How is it there? Very different? More European?′ they would ask us. As EU citizens, we could cross the island in every way we wanted (see my earlier text on EU citizens′ privileges abroad). The South did not feel more European to us. Perhaps more British and more Russian. Something these expats must have not heard is that there is another Middle Eastern society that sends lots of people to Cyprus, albeit on short-term trips. This is Israel. Due to the dominance of religious law in the country, civil marriage does not exist, which means that there is no authority to conduct marriage between people of different religions. A person is only considered Jewish if their mother is, or if they have completed an Orthodox conversion – a lengthy and purposefully torturous process. Cyprus is close enough geographically, and its lawyers are experienced with offering various services to foreigners, so it has become a hub for Israelis who are either not ′Jewish enough′ to have a right to marry, or want to marry someone of a different religion, or simply do not want to deal with religious authorities. The number of Israelis marrying abroad, mainly in Cyprus, stands at 20,000 each year. Cyprus is almost a synonym for civil marriage for secular Israelis. ″People should know that Iranians and Israelis are friends, only our governments keep saying mean things about each other,″ says one of the Iranian expats we met during the trip. All those colorful stories of people we met, and the knowledge that many more use the island as a place to hide from whatever their home society does not allow them to do, made me think about the island′s future. A boat service from the island apparently still runs to Lebanon and Syria. People from all over the Middle East apply to study there, and many dream to stay as academics. If one day the island is united or the last restrictions for movement of people are lifted, they will be mingling with secular Israelis, who are running away from religious authorities. Perhaps in one way or another they already meet. I am not one of those who believe that a face-to-face meeting solves everything. When people meet, they usually carry their privileges and inequalities with them. For me, a more interesting question is to what extent people of all these nationalities, given that their communities will probably grow, will live in parallel universes. The future of Cyprus will be not exclusively about Greek- and Turkish-speakers. This entry was posted in Politics, Social issues, Travel blog and tagged cyprus trip, expats, israel, mediterranean escape, middle east, students, studies, tourism, travel on 2015-01-28 by Daiva.